ISLAMABAD: The State Bank of Pakistan (SBP) on Thursday hiked the key interest rate by 25 basis points to 10.25% and further cut growth forecast, warning that the economy still faced elevated budget and current account deficits, and inflation would also spike due to record government borrowings. The central bank’s rate increase decision appears to be punishing the borrowers for the lax fiscal controls exercised by the Ministry of Finance. 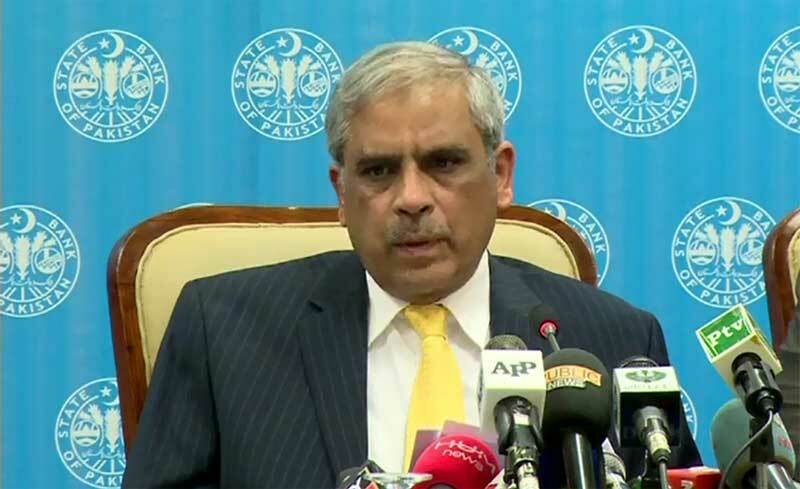 The Monetary Policy Committee (MPC) has decided to raise the policy rate by 25 basis points to 10.25%, effective February 1, 2019, for the next two months, announced SBP Governor Tariq Bajwa while addressing a press conference. The 10.25% rate is the highest in the past almost seven years. The tightening of monetary policy is contrary to the desire of the federal government which sought to keep the policy unchanged due to adverse implications of monetary tightening for the economic growth. The central bank has now hiked the rate by 450 basis points since January 2018 in a bid to ease the growing current account pressure which threatens to trigger a balance of payments crisis. However, the reasons that the governor cited suggested that exchange rate depreciation and monetary tightening had failed to contain the current account deficit. “Challenges to Pakistan’s economy persist and despite narrowing, the current account deficit remains high and fiscal deficit is elevated; core inflation is persistently high and this situation calls for continued consolidation efforts,” said Bajwa, while making a case for the rate hike. The current account deficit narrowed only 4.4% in first half of the current fiscal year to $8 billion. It seems that the central bank may face difficulties in convincing the International Monetary Fund (IMF) that does not endorse a nominal increase like that of 25 basis points as an effective tool. “There is some progress on the current account deficit side; we need to do more on the fiscal side,” Bajwa said in an apparent advice to the finance ministry, which he once headed as the finance secretary. He said the budget deficit continued to be high and “we have to bring down the fiscal deficit and current account deficit for economic stability”. The fiscal deficit for first half of the current fiscal year was likely to be higher than the same period of last year, said the governor. The MPC reiterated its earlier view that the fiscal policy would have to be proactive and play a supportive role in generating conditions for stability and sustainable growth. The governor also lowered the economic growth projection for the current fiscal year to around 4% from his two-month-old estimate of over 4%. In the last fiscal year, the economy had expanded 5.8%, the highest rate in more than a decade. Bajwa voiced hope that the current account deficit would remain around $13-14 billion. However, the first six-month trend shows that the deficit could still go beyond the desired level. He said the central bank was discouraging consumption and would not mind if consumer financing went down. Responding to a question on the negligible impact of monetary tightening, Bajwa said the MPC had to see the macroeconomic fundamentals and take decision on whether the measures that had so far worked should be taken forward. Talking about the IMF, he said the lender’s requirements would be seen once Pakistan took an IMF programme. “The IMF always says do more, but we will have to see things in our own perspective,” he added. Pakistan’s gross foreign currency reserves stood at $8.2 billion, Bajwa said, adding the reserves decreased due to market interventions, defence-related payments and external debt servicing. He revealed that the central bank bought dollars from the open market on Thursday. He was of the view that growing government borrowings from the central bank were problematic and would stoke inflation. In absolute terms, net budgetary financing from the SBP reached Rs3.77 trillion from July 1 to January 18, which was 4.3 times the amount borrowed during the same period of last year, said the governor. “This financing will potentially have inflationary consequences in the future,” he added. Even as stabilisation measures gradually work through the economy, underlying inflationary pressures persist. The SBP governor denied that banks were dictating the central bank in determining the interest rate path. The increase in the discount rate will add about Rs25 billion to the debt servicing cost, which is expected to hit Rs2 trillion – the highest ever. Bajwa said the permanent solution to external sector problems was the adjustment in the rupee’s value, which had substantially been done. The overvalued rupee was subsidising imports and putting an additional burden on exports, he added. “What is needed is to find a true equilibrium and that equilibrium is what the market determines,” said the governor. The overvalued rupee had negative implications for Pakistan’s economy, he added. “The SBP is not in favour of unnatural intervention in the exchange market,” Bajwa said and added the rupee movement was done in consultation with the federal government. The governor said Pakistan had more or less met financing requirements for the current fiscal year on the back of loans from Saudi Arabia, the United Arab Emirates (UAE) and commercial financing. He pointed out that deferred payments on oil supply had been finalised with Saudi Arabia this week and an agreement would be signed on February 16 during the visit of Saudi crown prince. The governor said China had in the past helped the economy in the shape of foreign currency deposits, commercial loans and currency swap arrangements, hoping that the trend would continue in future as well. He said economic data confirmed that the stabilisation measures implemented over the last one year were taking hold and key monthly indicators were showing visible signs of deceleration in domestic demand. But the governor said the average headline Consumer Price Index (CPI) inflation stood at 6% in the first half of FY19, which was considerably higher than 3.8% in the same period of last year. Core inflation, measured by non-food and non-energy components of the CPI basket, reached 8.4% in December 2018, he added.